Is that a big number? In life, and particularly in politics, this is a question you often have to ask yourself. The UK has a $2.57 trillion national debt. Should we be worried? To really answer that question, we need to put the number in context. How does it compare to other countries' national debts? How does it compare to UK tax takings? How fast is it growing? Andrew C. A. Elliott's first goal is to get you asking these kinds of questions, to drill home the idea that numbers in isolation don't really mean anything. He achieves this with aplomb, by placing every number throughout the book in context, for example through tables comparing 18 countries for a range of markers. Elliott's second goal is to provide you with the numeracy to make the appropriate cross-comparisons. The core to his approach is to provide you with an enormous range of "landmark numbers" to compare any new data point to. A few that have stuck with me include the US and UK populations (300 million and around 60 million), the UK GDP (around $3 trillion), the speed of light (3x108 m/s) and the time it takes light to travel from the Sun to Earth (8 1/3 minutes). Even this small collection of specific examples is enough to grapple with a huge range of numbers when coupled with tools to broaden their uses. For example, one recurring message of the book is to consider country data per capita (so that the UK national debt becomes $40,200 per person — a large figure, but much smaller than the personal debt of many mortgage holders). Elliott proposes this breakdown of big numbers into manageable parts more generally too. One example that has lingered with me is that of a Roman theatre. Initially I had no gauge of whether the quoted capacity of 5,000 was plausible. But breaking it down to 9 sections of 38 rows with 15 people per row suddenly unlocks my ability to visualise. If you're already fairly numerate, and Elliott's recommended techniques of divide and conquer, rates and ratios, and log scales are familiar to you, I would suggest that an afternoon on the excellent associated website . 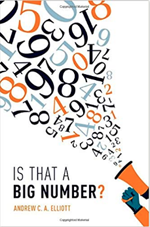 http://www.isthatabignumber.com would be a better use of your time than reading this book, giving you a wider collection of landmark numbers to choose your favourites from. But if those techniques are unfamiliar, the methods and examples for understanding big numbers provided by the book give a gentler introduction to the tools of numeracy than diving straight into the website would. Who knows which examples will be the ones to stick with you! Kweku Abraham is a PhD student at the University of Cambridge, where he researches statistical theory, in particular analysing Bayesian methods.